One look at Excel 2007, with its new Office Button, Quick Access toolbar, and Ribbon, and you realize you’re not in Kansas anymore. 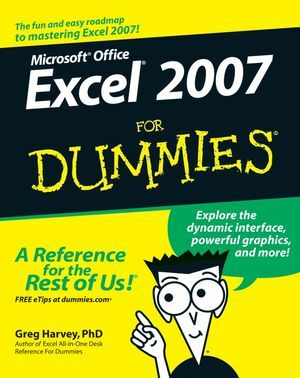 Well, have no fear— Excel 2007 for Dummies is here! If you’ve never worked with a computer spreadsheet, or if you’ve had some experience with earlier versions of Excel but need help transitioning, here you’ll find everything you need to create, edit, format, and print your own worksheets (without sacrificing your sanity!). 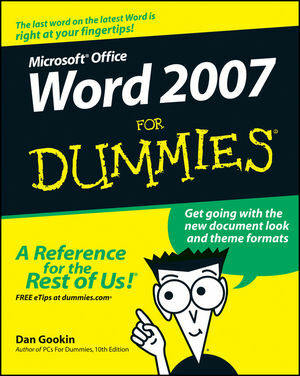 Excel 2007 for Dummies covers all the fundamental techniques, concentrating on only the easiest, most user-friendly ways to get things done. Plus, in keeping with Excel 2007’s more graphical and colorful look, Excel 2007 for Dummies has taken on some color of its own, with full-color plates in the mid-section of the book illustrating exactly what you’ll see on your screen. Whether you read it from cover to cover or skip to the sections that answer your specific questions, the simple guidance in this book will have you excelling at home or in the office no time. Greg Harvey has authored tons of computer books, the most recent being Excel Workbook For Dummies and Roxio Easy Media Creator 8 For Dummies, and the most popular being Excel 2003 For Dummies and Excel 2003 All-In-One Desk Reference For Dummies. He started out training business users on how to use IBM personal computers and their attendant computer software in the rough and tumble days of DOS, WordStar, and Lotus 1-2-3 in the mid-80s of the last century. After working for a number of independent training firms, Greg went on to teach semester-long courses in spreadsheet and database management software at Golden Gate University in San Francisco. His love of teaching has translated into an equal love of writing. For Dummies books are, of course, his all-time favorites to write because they enable him to write to his favorite audience: the beginner. They also enable him to use humor (a key element to success in the training room) and, most delightful of all, to express an opinion or two about the subject matter at hand. Greg received his doctorate degree in Humanities in Philosophy and Religion with a concentration in Asian Studies and Comparative Religion last May. Everyone is glad that Greg was finally able to get out of school before he retired. Part I: Getting In on the Ground Floor. Chapter 1: The Excel 2007 User Experience. Chapter 2: Creating a Spreadsheet from Scratch. Part II: Editing Without Tears. Chapter 3: Making It All Look Pretty. Chapter 4: Going through Changes. Chapter 5: Printing the Masterpiece. Part III: Getting Organized and Staying That Way. Chapter 6: Maintaining the Worksheet. Chapter 7: Maintaining Multiple Worksheets. Part IV: Digging Data Analysis. Chapter 8: Doing What-If Analysis. Chapter 9: Playing with Pivot Tables. Part V: Life Beyond the Spreadsheet. Chapter 10: Charming Charts and Gorgeous Graphics. Chapter 11: Getting on the Data List. Chapter 12: Hyperlinks and Macros. Chapter 13: Top Ten New Features in Excel 2007. Chapter 14: Top Ten Beginner Basics. Chapter 15: The Ten Commandments of Excel 2007.